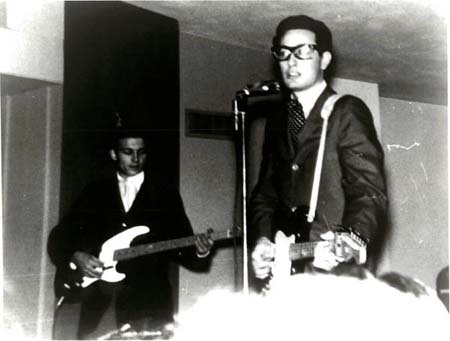 Buddy Holly wrote his own material; used the recording studio for double-tracking and other advanced techniques; popularized the two guitars, bass, and drums lineup; and recorded a catalogue of songs that continue to be covered: “Not Fade Away,” “Rave On,” “That’ll Be the Day,” and others. His playful, mock-ingenuous singing, with slides between falsetto and regular voice and a trademark “hiccup,” has been a major influence on Bob Dylan, Paul McCartney, and numerous imitators. Waylon Jennings (left) playing bass literally dodged a bullet…. Two of the band members who were travelling with Buddy on that fateful tour went on to make huge contributions to country music. One of them was Waylon Jennings (above), who was filling-in on bass. He was also originally scheduled on the plane, headed from Clear Lake, Iowa, to Moorhead, Minn.– but he gave up his seat to the Big Bopper, who was ill and wanted to find a doctor in Moorhead the next morning. Waylon, of course, went on to land in the Country Music Hall of Fame. The other band member to leave an impact on country was Tommy Allsup. Like Waylon, Tommy gave up a seat on that plane — to “La Bamba” singer Ritchie Valens. This entry was posted in American, disaster, history, Icons, music, style and tagged 1950s, American, artist, Buddy Holly, history, icon, legend, music, Rock, Rock and Roll, star, Waylon Jennings. Bookmark the permalink. 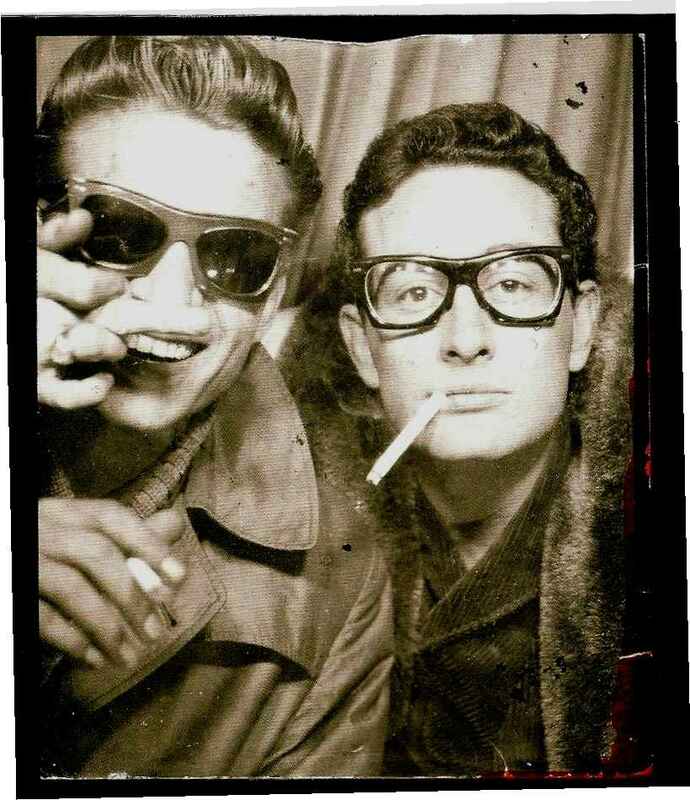 That last photo of Buddy Holly is amazing. He was just a regular dude with vision. A true inspiration. Thanks for the reminder. Great picture, I wonder where that guitar is now? That last picture is amazing. stormsnbellsNrailroads… Buddy’s guitar is in the Buddy Holly Centre in Lubbock, Texas. There’s a small museum there in homage to him with all sorts of things. Including his glasses. Quite humbling really. 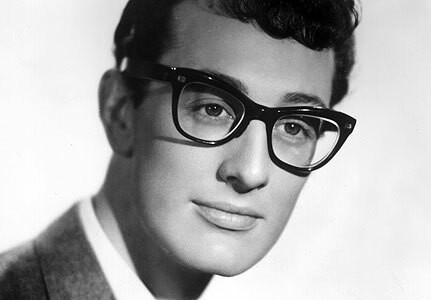 I can only imagine what American pop music would be today if Buddy Holly hadn’t died. He was so progressive and open-minded. I think he would have had an answer to the British invasion and may have won the war. Buddy Holly would’ve allied with the Brits. He would’ve shown these guys what it really was all about. See: When the Beatles arrived in Ed Sullivan’s studio in NYC in Feb. ’64, John Lennon’s first question was: “Gee, is this the stage where Buddy Holly and the Crickets performed?” Indeed, it was that very stage. I think Bob Dylan went to one of Holly’s last concerts in winter ’59. After that, he bought his first electric guitar (he only swapped it for acoustic after he dug Woody Guthrie in the early 60s). 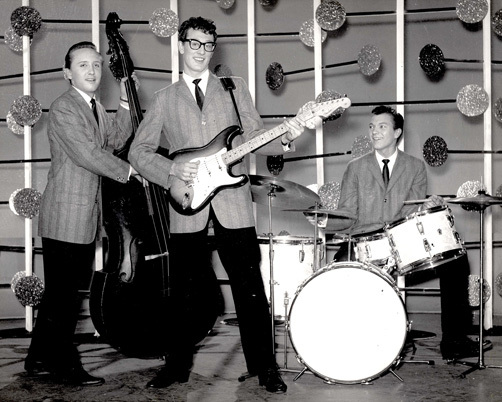 It’s just incredible how significant Buddy Holly’s influence on later generations is.